The Pizza House: Just as good second time around! After my initiation into Grubgang at the Pizza House many months ago, I could think of nowhere better that I would want to celebrate my birthday. 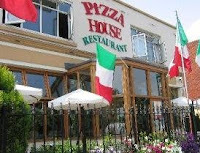 So, as soon as I was asked for my choice this month, I demanded we re-vist the Pizza House Restaurant! Rubbish name, good food, entertaining staff! The restaurant name gives the impression of a tacky, run-of-the-mill, fast-food, Italian pizzeria. But the only thing that is really poor about The Pizza House is its choice of name. However, saying the restaurant owner, Giuseppe Mascia, picked a rubbish name is unfair when you consider he opened The Pizza House back in 1977, when pizzas were largely unknown in the UK! Today, The Pizza House, is still very much a family run business, which gives it a real cosy, warm feel - a little piece of Italy in Pompey. The Pizza House is a really fun restaurant - the staff are literally bonkers! If they are not running around offering every 'beautiful lady' some black pepper from their gigantic grinders, they are either singing songs in Italian (probably praising either AC Milan or Pompey FC). In terms of the food, I wouldn't say it is out of this world, but it is good value, honest Italian food. I had cheesy garlic bread for starters. For main I had the cannelloni (pasta tubes filled with spinach and minced meat finished with a cream sauce and cheese), which is really tasty. I liked the fact they leave bread sticks and garlic butter for you to munch on while you wait for your food and they also offer you free liqueur digestives after your meal, which are very nice too. The only disappointing fact is the time it takes to get the bill. You will probably go through a whole a bottle of wine (each) before you get the bill! - But hay ho, what's the problem with that!